My friend Megan is a big fan of my cheeseballs and she's made the recipes a couple times when she's entertained family and friends. Because I know how much she enjoyed them, I wanted to introduce her to another cheeseball that's got the flavor of buffalo chicken wings. Why buffalo chicken? It's one appetizer I can never turn down and figured my guests would like all the flavor of buffalo chicken wings without the mess. Cheeseballs are great appetizers without having to do much work. You can make them in advance (which is great so that the flavors can meld) and they're much more affordable homemade than buying them prepared. When I make cheeseballs, I just combine various ingredients and bind them with cream cheese. 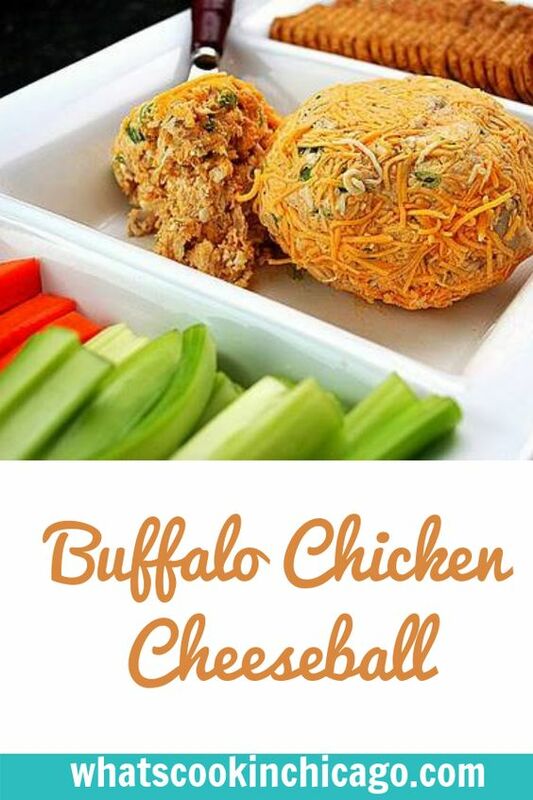 For my Buffalo Chicken Cheeseball, I put together all the flavors reminiscent of buffalo chicken wings - chicken, blue cheese, cheddar cheese, ranch dressing and hot sauce. Add the cream cheese to bind it all together, form the whole thing in a ball and coat with more cheddar cheese. Voila! You've got a flavorful appetizer which may come in handy for those upcoming football games! Combine all the ingredients in a bowl. 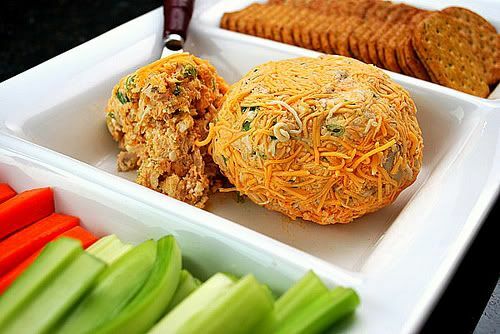 Form into a ball and roll in the shredded cheddar cheese to coat. Wrap in plastic wrap and chill for at least 1-2 hours before serving. Serve with crackers, carrot sticks, and/or celery sticks. I hope you'll enjoy it ! you can leave a comment in english if you want ! Sweet I have been looking for guy food apps for a bachelor party. Was going to do a cheese ball just with cream cheese and habanero cheddar but I like your flavors a lot better. I love cheeseballs but don't make them nearly enough. This looks great!!! I've never made a cheeseball but love tobest them. This sounds like the perfect Sunday football snack. This looks so good! I'm such a sucker for buffalo chicken anything. Now I have to make this TONIGHT. This looks and sounds amazing. I can't wait to make it. It seems like the perfect food for football! Yum! !